This appendix describes the classification of igneous and sedimentary rock in rather more detail than I cared to go into in the main text. The classification of igneous rocks begins with determining whether the rock is a tuff, an extrusive rock, or an intrusive rock. If the rock appears to consist mostly of tephra that has not been reworked by water, it is a tuff. (If it consists of reworked tephra, it is more properly classified as a sedimentary rock.) If the rock is not composed of tephra, but is glassy or aphanitic or consists of phenocrysts in a glassy or aphanitic matrix, then it is classified as extrusive. If the rock consists of visible mineral grains, it is classified as intrusive. There seems to be less agreement on the correct classification of tuffs than any other kind of volcanic rock. One scheme in common use classifies tuffs by whether the individual clasts are glassy, lithic, or crystalline. Another scheme starts by classifying the tuff purely by the size of the grains, so that there are fine ash tuffs, coarse ash tuffs, lapilli tuffs, or pyroclastic breccia, in increasing order of clast size. Of course, one can combine these systems, and describe a tuff (for example) as a glassy fine ash tuff. I have not actually seen these terms used much in practice. Papers on the Jemez tend to describe tuffs by their appearance (pinkish, white, grey), by the content of larger pumice or lithic clasts, and by the degree of welding. The Otowi tuff, for example, is typically described as an unwelded white to pinkish tuff with abundant pumice and lithic clasts. The fields in the diagram, and any further refinements in classification, are as follows. F represent foidites. They are included in the diagram for completeness; in practice, extrusive rocks with this low a silica content are practically nonexistent. One exception is carbonatites, which have their own separate classification scheme. Pc represents picritic basalts. These are ultramafic basalts characterized by a high content of olivine, often as obvious phenocrysts. S1 represents trachybasalts. These are further subdivided by the sodium versus potassium content. If Na2O > K2O + 2, the rock is a hawaiite, otherwise it is a potassic trachybasalt. S2 represents basaltic trachyandesites. Again, these are further subdivided, with the sodic versions called mugearite and the potassic versions called soshonite. S3 represents trachyandesites. The sodic and potassic versions are called benmoreite and latite. T represents trachytes and trachydacites. Trachydacites are richer in quartz than trachytes. 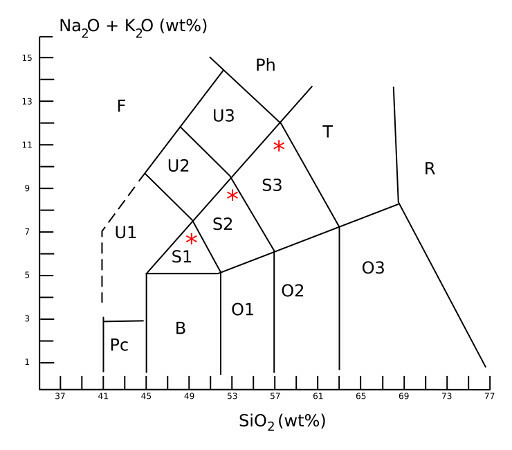 U1 is further broken down by the normative content of olivine. Since the rock is too fine-grained for the olivine to be measured directly, it is calculated from the overall composition of the rock according to a set of standard rules (the normative composition) to determine the theoretical olivine content. If this is less than 10%, the rock is a tephrite; if over 10%, the rock is a basanite. Of these, only B, O1, O2, O3, R, S1, S2, S3, and U1 are found in any quantity in the Jemez area. These are also known as plutonic rocks. They are classified by the mineral content. Intrusive rocks containing more than 90% mafic minerals, or containing more than 50% carbonate minerals, have their own special classification schemes. Ordinary intrusive rocks are classified by the relative content of quartz, alkali feldspar, plagioclase, and feldspathoids (QAPF) with the understanding that feldspathoids and quartz almost never occur together in nature. The rocks fall into one of the fields in the following diagram. 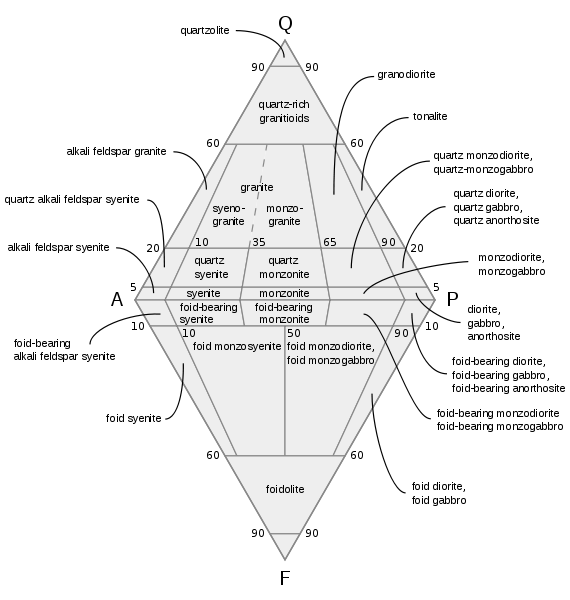 Here Q is quartz volume percentage, A is alkali feldspar volume percentage (potassium feldspar plus albite), P is plagioclase volume percentage, and F is feldspathoid volume percentage. All volume percentages are normalized to exclude other minerals. The distinction between diorite and gabbro is drawn by whether the plagioclase is calcium-rich (gabbro) or sodium-rich (diorite). Anorthosites are rocks consisting of more than 90% calcium-rich plagioclase (anorthosite). Sedimentary rocks are broadly divided into mudstones, sandstones and conglomerates, and carbonates, with a few additional minor categories such as ironstones and evaporites. Mudstones make up the majority of sedimentary rocks and are composed predominantly of particles smaller than 0.0625 mm (0.0025 in). Particles this small are mostly clay, which is formed by chemical decomposition of feldspars, micas, and other minerals. Sandstones (composed predominantly of clasts between 0.0625 mm and 2mm in size) and conglomerates (composed predominantly of clasts larger than 2mm in size) are formed by mechanical weathering of source rock. Carbonates are formed by precipitation of calcium or magnesium carbonate from bodies of water. Mudstones are further classified as claystones if most of the particles are less than 0.004 mm in size and as siltstones if most of the particles are greater than 0.004 mm in size. Such rocks are deposited in relatively calm water which allows fine particles to settle out of suspension. If the rock is fissile, easily splitting into very thin parallel layers, then it is described as a shale. Shales are deposited when sediment containing abundant flaky mineral grains (micas or clays) is deposited in a very quiet environment, where the flakes settle in a preferred orientation. Sandstones consist predominantly of clasts between 0.0625mm and 2mm in size. Though less abundant than mudstones, they tend to stand out due to a greater degree of induration. Sandstones are classified by predominant grain size and degree of sorting, by the amount of clay matrix between the clasts, and by clast composition. Sandstones vary from very fine (0.0625mm to 0.125mm clast size) to very coarse (1mm to 2mm clast size). If the clasts are all nearly the same size, the sandstone is described as well-sorted. Sandstone at the other extreme, with a wide variety of clast sizes, are described as poorly sorted. The clasts themselves may be described as well-rounded to angular, which is self-explanatory. A well-sorted sandstone has considerable pore space between the clasts. This may be vacant or it may be filled with a much finer matrix. Sandstone with less than 15% clay matrix between the clasts is described as an arenite, while sandstone with more abundant clay between the clasts is described as a wacke. The most common clast mineral is quartz, since quartz is strong (lacking cleavage planes along which it could easily split), hard, and chemically inert. Arenites containing 90% or more of quartz are described as quartz arenites. The next most common clast composition is feldspar, and arenites containing less than 90% quartz and predominantly feldspar in the non-quartz clasts is described as feldspathic arenite. If the feldspar component exceeds 25%, the sandstone is described as arkose. Although feldspar tends to be abundant in source rocks, and is a fairly hard mineral, it has prominent cleavage planes that reduce its strength and it is chemically unstable, weathering to clay. Thus feldspar clasts are not as durable as quartz. The final major type of clast is lithic clasts, composed of more than one mineral. Such clasts typically form from fine-grained rocks such as volcanic rocks or some metamorphic rocks, since otherwise the clasts will tend to consist of a single mineral. An arenite with less than 10% quartz and more lithic clasts than feldspar clasts is described as a lithic arenite. A well-sorted quartz arenite is described as a mature sandstone, since it has been reduced to its most stable mineral content and has been transported a considerable distance (as indicated by the sorting.) Less mature sandstones contain increasing quantities of feldspar clasts and matrix, and a lithic wacke is a very immature sandstone, since lithic clasts are highly unstable. Conglomerates contain abundant clasts over 2mm in size. The possible size range is enormous, with some conglomerates having abundant clasts the size of large boulders. In addition to clast size, conglomerates are classified by whether they are matrix-supported or clast-supported, by the degree of sorting and layering, and by the petrology of the individual clasts. Most conglomerates have relatively rounded clasts; those containing numerous angular clasts, which can only form very close to their source rock, are known as breccias. A clast-supported conglomerate is one in which the clasts are in contact with each other, so that the weight of the bed is supported by the clasts themselves. A matrix-supported conglomerate has enough fine matrix between the clasts that the clasts are not generally in contact, and the weight of the bed is supported primarily by the matrix. These categories are roughly comparable to the distinction between an arenite and a wacke sandstone, except that the sandstone categories emphasize the clay content of the matrix as well as its abundance. A conglomerate can be a mixture of poorly sorted clasts with no particular structure, or it can show a higher degree of sorting, with layers of various clast sizes. The clasts may be oriented at random, or they may have a preferred orientation (an imbricated conglomerate) that indicates deposition in a river channel. The imbrication then gives clues to the direction of flow of the river. The petrology of conglomerate clasts is important in their classification, since the clasts are large enough and unweathered enough to be highly representative of the source rock. The most common clasts are quartz- and feldspar-rich igneous and metamorphic rock, since these are relatively durable, but clasts can include volcanic rocks and even well-indurated sedimentary rocks and tuffs. There are two carbonate rocks of any significance: limestone and dolostone. Limestone consists mostly of calcite precipitated in seawater, though rare examples of freshwater limestone are known. Because calcium carbonate becomes soluble in deep water, carbonates are almost always deposited in a shallow marine environment. Dolostone is composed of dolomite, CaMg(CO3)2, and forms only in unusual shallow marine environments. It is uncommon to find intermediate compositions containing both calcite and dolomite; carbonates tend to be either one or the other. Carbonate rocks are particularly prone to contain fossils, which often weather out of the rock more or less intact. The best time and place to hunt fossils is in a weathered limestone bank after a heavy rain, which exposes fresh fossils. Ironstone is a sedimentary rock with a high content of iron oxides. It typically forms from deep weathering in a tropical climate. Evaporites are unusual sedimentary rocks formed by nearly complete evaporation of a shallow body of water. They include relatively soluble minerals such as halite (NaCl, table salt), sylvite (KCl), and calcium sulfates (CaSO4 with varying amounts of water). Of these, gypsum, CaSO4·2H2O, is the least soluble and most likely to be preserved in outcroppings. Other minor types are not found in the Jemez area. Copyright © 2015 Kent G. Budge. All rights reserved.